Synopsis: An Indian man who was adopted by an Australian couple as a five-year-old after becoming lost in Calcutta decides to track down his real mother. Even before he embarks on a seemingly impossible quest to find his birth mother, Saroo (Dev Patel – The Man Who Knew Infinity) has beaten the odds by escaping the fate suffered by so many children who are swallowed up each year by India’s crowded cities. Lion, the feature debut from Garth Davis, tells us that, in India, more than 80,000 children simply disappear each year. The number is so vast that it becomes a little meaningless until one narrows the calculation down to one child disappearing every seven minutes. 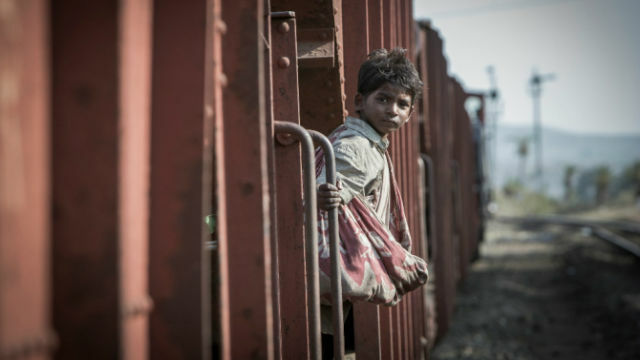 In the mid-1980s five-year-old Saroo (Sunny Pawar) contributed to that statistic when he stumbled bleary-eyed onto a decommissioned train at his local railway station after failing to find his brother, Guddu (Abhishek Bharate), who had left his little brother sleeping on a platform bench while he looked for work. Apart from a driver he couldn’t contact, the train was empty and carried him the 1600km from his small country village to the city of Calcutta. Unable to speak Bengali, Saroo became a street urchin. Twice, he narrowly avoided the attentions of predatory adults whose plans for him the film never makes completely clear – although paedophilia is strongly implied. Saroo was one of the lucky ones. He was adopted by a wealthy Australian couple who chose to adopt two disadvantaged children instead of having any of their own. Raised in Australia, Saroo and his adoptive brother enjoy a life that would have been beyond their reach had they remained in India. But, in his heart, Saroo never really leaves the mother, older brother, and baby sister with whom he once shared a one-room shack, and as he approaches 30 the compulsion to search for the hometown he barely remembers becomes irresistible. Lion is very much a film of two halves. The first forty-five minutes or so, in which little Saroo struggles to cope in an uncaring city filled with predators who approach with smiles and kindness, speaks to our protective instincts and is consequently more gripping than the second hour. Sunny Pawar spends much of his time running, and it’s an awkward coming together of knees and elbows that lacks grace or style but which highlights just how young and defenceless and vulnerable Saroo is. He survives, and grows into a healthy young man whose apparent confidence hides both his confused sense of identity and his guilt over the grief and anxiety his birth family must continue to suffer over his disappearance. Curiously, it’s at this point that Saroo is in danger of straining our sympathy by becoming a little too precious over the emotional burden of his quest. His stress over the impact his decision will have on his adoptive mother (Nicole Kidman – The Paperboy, Genius) is unconvincing as is his break from his supportive girlfriend (Rooney Mara – The Girl with the Dragon Tattoo, Ain’t Them Bodies Saints). Some of this self-indulgence on Saroo’s part is tempered by Dev Patel’s considerable charm as a leading man, but it’s the canny Kidman who understands where the emotional weight of the movie lies. The unwavering strength, support and understanding shown by her selfless Sue Brierley is every bit as emotionally uplifting as Saroo’s story, even if it lacks the dramatic impetus. It would be easy for Lion to succumb to emotional manipulation, but it sidesteps all the obvious pitfalls to deliver an uplifting story that celebrates both the unconditional love of motherhood and the unbreakable bond that drives Saroo to return to his roots. It’s probably the precocious Sunny Pawar who will remain in the audience’s memory, but a special mention has to be made for Greig Fraser’s sublime cinematography which captures stunning scenes of India’s land- and cityscapes to create a sense of both the enormity of the country and the tininess and insignificance of one small boy amongst that teeming tide of humanity.